CNMI Marriage Encounter: The WEEKEND is near! Get ready! Get ready for another exciting ME Weekend this Friday through Sunday at the Aqua Resort Saipan! We'll be welcoming 25 new couples into the community and look forward to seeing all the ME Alumni! 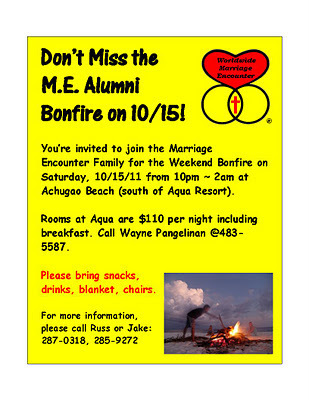 Please join us at the Greet in, F&B meal times, Greet off and the special Alumni Bonfire on Saturday night at 10pm on the beach south of Aqua.